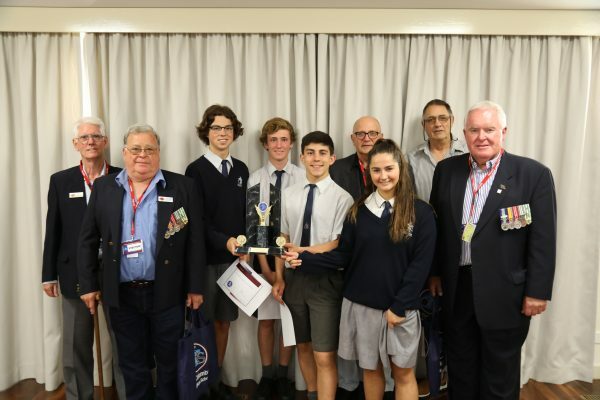 On Wednesday 11th October, Year 10 students were fortunate enough to be joined by five Vietnam Veterans who were so impressed with the quality presentations created by our students in the annual HSIE and English ‘DocFest’. Our guests gave out the Veterans Prize and also the overall DocFest Trophy where the students realised that their efforts helped to preserve the sacrifices made by the veterans. Students produced eight minute documentaries in teams of four, that addressed reasons for Australia’s involvement, impacts on soldiers, opposition groups and key battles such as Long Tan. We congratulate Ben Bowles, Jeremy Morgan, Sam Amini and Sarah Ross for claiming both Veterans Prize and the DocFest Trophy for their film entitled From Vietnam Personally which you can view below.